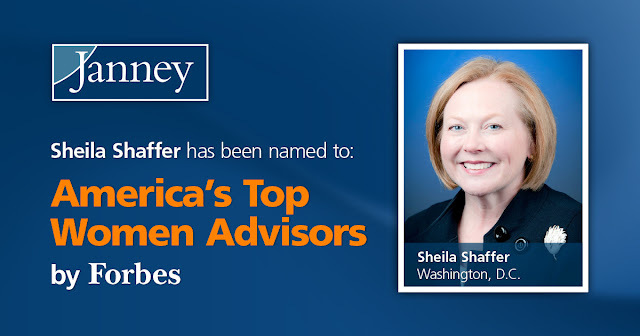 Philadelphia, Pa. – March 1, 2017 – Janney Montgomery Scott LLC (“Janney”) today announced that Sheila Shaffer, of the firm’s Washington DC office, has been named to Forbes’ 2017 ranking of “America’s Top Women Advisors,” published February 28, 2017. The Forbes ranking of America’s Top Women Wealth Advisors, developed by SHOOK Research, is based on an algorithm of qualitative and quantitative data, rating thousands of wealth advisors with a minimum of seven years of experience and weighing factors like revenue trends, assets under management, compliance records, industry experience and best practices learned through telephone and in-person interviews. Portfolio performance is not a criteria due to varying client objectives and lack of audited data. Sheila is the leader of Shaffer Wealth Advisory Group, a multi-generational team at Janney Montgomery Scott LLC. As a Certified Financial Planner CFP®, Sheila and her team provide personalized comprehensive wealth management and customized portfolio solutions for affluent clients. The team is responsible for managing $500 million in client assets for individuals, small businesses, and multi-generational families. To learn more about Sheila and the Shaffer Wealth Advisory Group, click here.